A few weeks ago a prospective member emailed me to ask if the TXBA Pro Player would work on his Android phone. He was thinking about signing up for the Locals Program, but since he uses his phone for most things, he was hesitant to sign up without being able to test out the player first. Ever since the Locals program debuted in 2015, people have been asking me to implement a try-out period. And while this hasn't happened yet, I realized that this particular problem didn't require a full-on trial, he just needed to be able to test out the player. That gave me an idea - a way that prospective customers could try out the player, without having to sign up for anything. So here it is, a completely free sample of all the features of the TXBA Pro Player. 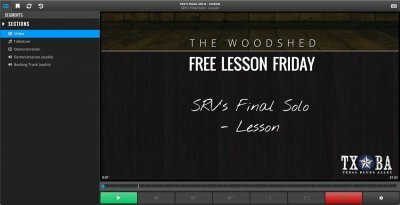 I've loaded the player with one of my best Free Lesson Friday videos called SRV's Final Solo, and it's exactly what it sounds like. It's over an hour long, I teach you every note of Stevie's last solo he ever played, and there's even interactive SoundSlice tablature to go with it. If you need help using any of the features, check out our Pro Player Guides over in TXBA Headquarters.